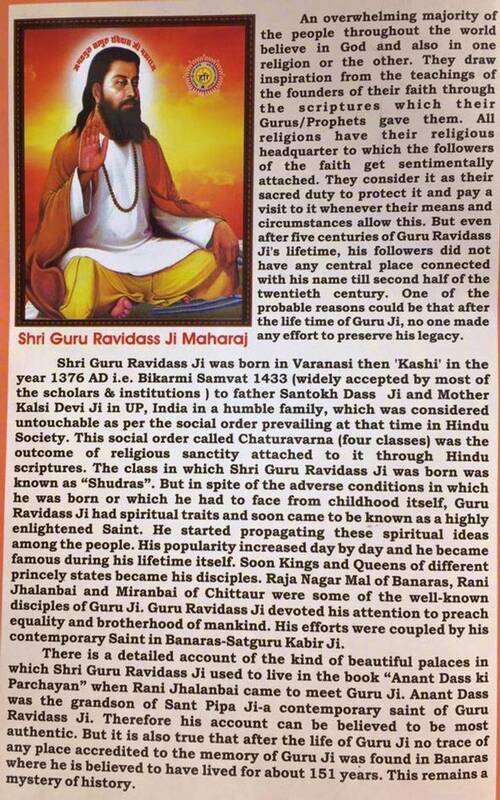 JagatGuru Ravidass Ji was born in Varanasi then ‘Kashi’ in the year 1377 AD (Bikrami Samvat-Magh Sudi 15, 1433). But even after six centuries of Guru’s Ji’s lifetime, his followers did not have any central place connected with his name till second half of twentieth century. One of the probable reasons could be that after the lifetime of Guru Ji, no one made any effort to preserve his legacy. 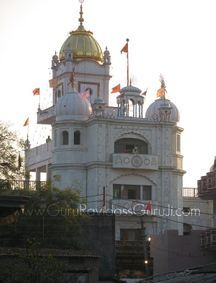 There is detailed account of the kind of beautiful palaces in which Shri Guru Ravidass Ji used to live in the book “Anant Dass ki Parchayan” when Rani Jhalanbai came to meet Guru Ji. 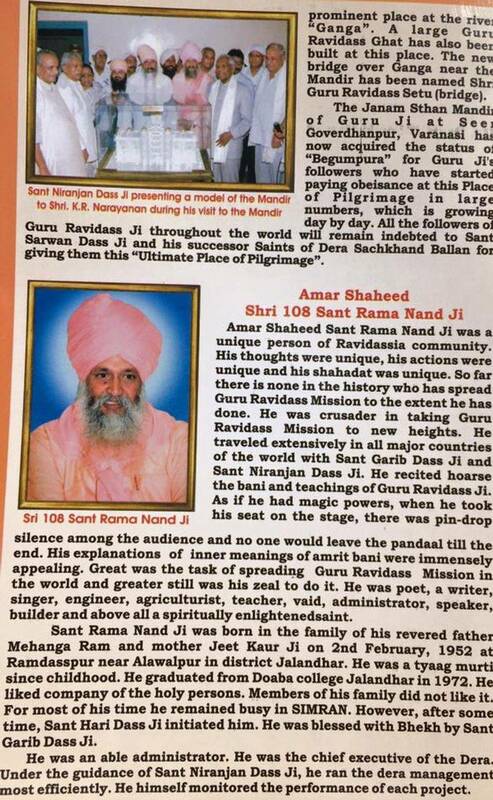 Anant Dass was the grandson of Sant Pipa Ji- a contemporary saint of Guru Ravidass Ji. Therefore, his account can be believed to be most authentic. But it is also true that after the lifetime of Guru Ji no trace of any place accredited to the memory of Guru Ji was found in Benaras where he is believed to have lived for about 151 years. This remains a mystery of history. 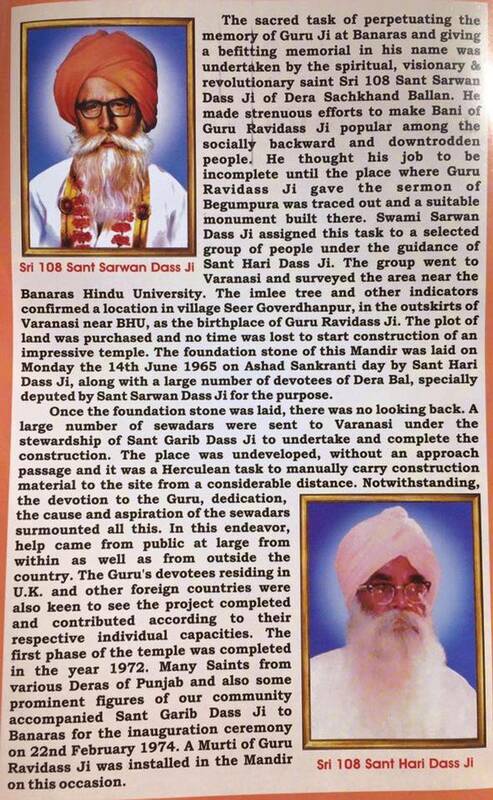 The sacred task of perpetuating the memory of Guru Ji at Benaras and giving a befitting memorial in his name was undertaken by the spiritual, visionary and revolutionary saint Shri 108 Sant Sarwan Dass Ji of Dera SachKhand Ballan. He made strenuous efforts to make Bani of Guru Ravidass Ji popular among the socially backward and downtrodden people. He thought his job incomplete until the place where Guru Ravidass Ji gave the sermon of Begupura was traced out and a suitable monument built there. Swami Sarwan Dass Ji assigned this task to a selected group of people. The group went to Varanasi and surveyed the area near the Benaras Hindu University. The Imlee tree and other indicators confirmed a location in a village Seer Goverdhanpur, in the outskirts of Varanasi near BHU, as the birthplace of Guru Ravidass Ji, the plot of land was purchased and no time was lost to start construction of an impressive temple. 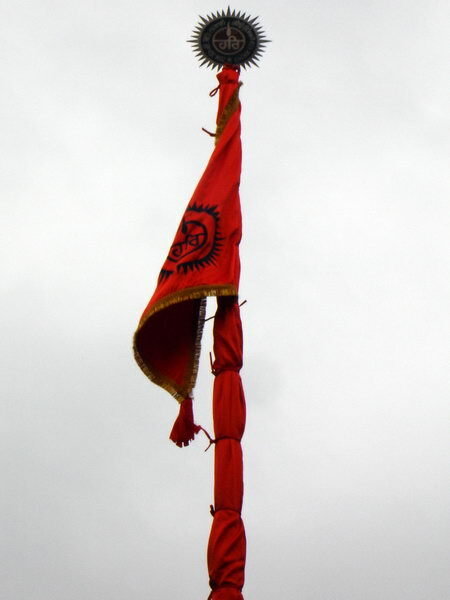 the towns through which it passed in the states of Punjab, Haryana, Delhi and U.P. 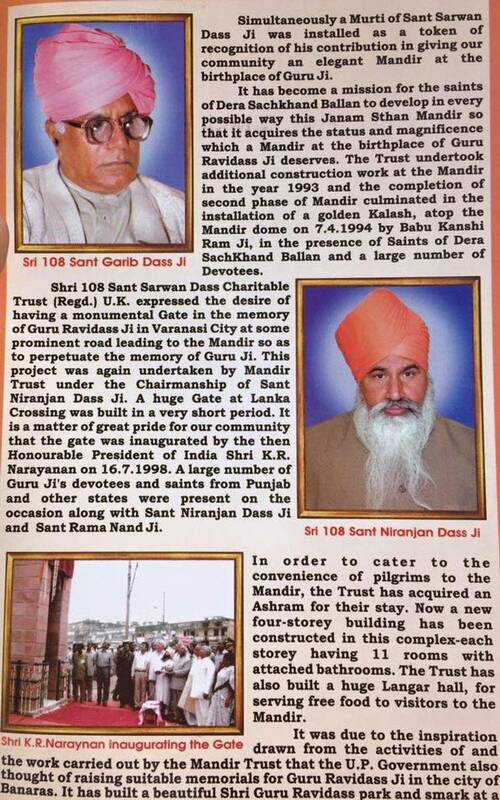 Then came the historic moment for our community when Shri 108 sant Niranjan Dass Ji and Sant Rama Nand Ji thought of gold plating the whole Mandir. 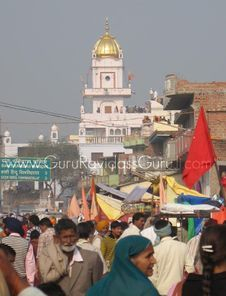 Earlier 31 small and big domes had been decorated with gold Klashes on 625th Birth Anniversary of Guru Ji. 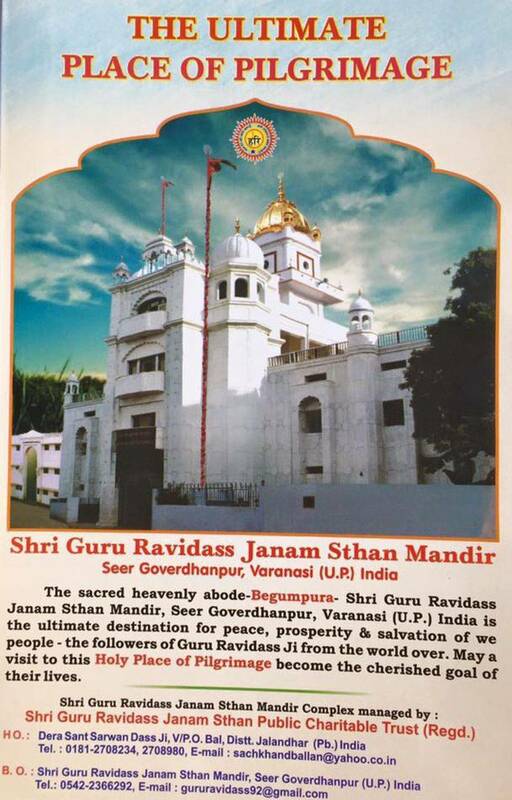 The inaugural ceremony for gold plating the Mandir had taken place in the year 2008 on the occasion of Jyanti of Guru Ji. 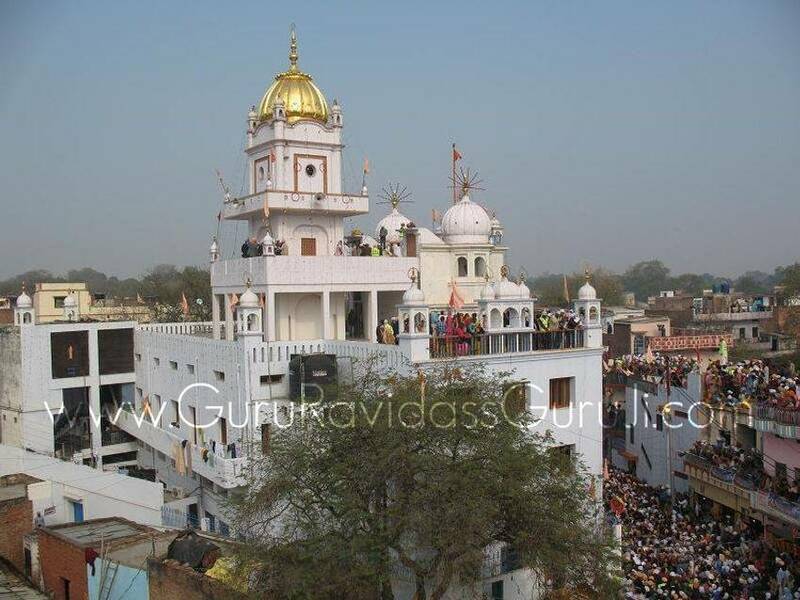 Fulfilling the dream of Sant Rama Nand Ji the top dome of the Mandir was bedecked with gold and inaugurated on the Jyanti celebrations in the year 2009. 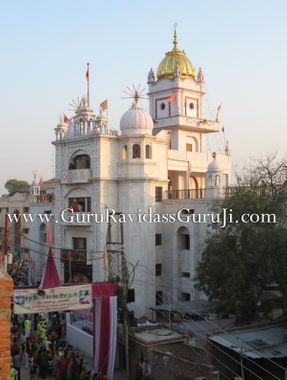 The affairs of the Mandir are managed by Shri Guru Ravidass Janam Asthan Mandir Public Charitable Trust, which makes continuous endeavours to enhance the facilities at the Mandir for the convenience of the pilgrims. As a result of these efforts, a big Langar Hall and a Yatri Niwas have been constructed. 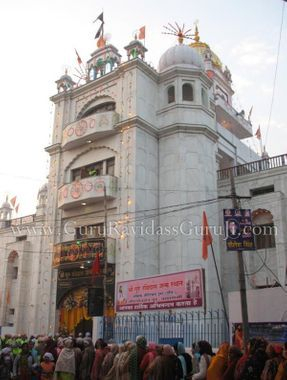 Today Shri Guru Ravidass Janam Asthan Mandir Varanasi is known worldwide among followers of Guru Ji. It is Mecca for them, a symbol of Dalit Identity and Dalit awakening.